In 1983, as I started secondary school at the age 11, I became aware of a band, fronted by a 6 foot 5 Scottish singer by the name of Fish who became my important band, the one band that helped me understand that music was going to become my driving force. The band, Marillion, were musically amazing, featuring one of the best guitarists, Steve Rotherey, I’ve ever seen. But most influential on me, as a kid beginning to find out about literature, art and poetry, were the lyrics. Fish’s lyrics opened my eyes to a world of rhyme and descriptive prose that has stayed with me since the day I first heard Fugazi with the refrain that makes the title of this blog post. And, in celebration on World Poetry Day yesterday, starting with the man they call the Fish here are 10 poets who’ve impressed, inspired and given me enjoyment through their ability with words. 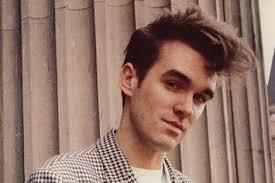 As mentioned above Fish as a lyricist is a poet for whom I have the utmost respect and admiration. 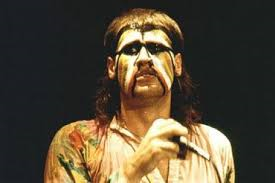 In a near 40 year career Fish has consistently written lyrics of great beauty and emotion, across a number of themes from achingly tender love songs such as Lavender with Marillion and from his first solo album Cliché through songs of loneliness and regret, like Sugar Mice; to politically charged songs on subjects dear to the big man’s heart such as the effect of war on man and the wider world which is a theme he has consistently returned to from early days with songs like Forgotten Sons up to his most recent solo album, A Feast of Consequences, that visits both the First World and Vietnam Wars. The skill in being able to write in such different ways whilst retaining an empathy for the subjects he writes about sets Fish apart as a poet of great skill. Perhaps the best well known poet musician of them all is the man born Robert Zimmerman, who, as Bob Dylan, has been awarded the Nobel Prize for Literature. Coming to prominence firstly within the American folk scene his politically charged songs, influenced as they were by the likes of Pete Seeger and Woody Guthrie have themselves become so influential to a whole raft of musicians that followed him such as Bruce Springsteen and Tom Petty. But for me Dylan’s poetry really finds its true strength when Bob plugged in and went electric and his began to explore the absurd and surreal with songs such as Ballad of a Thin Man, Queen Jane Approximately and the title track Highway 61 Revisited. Dylan has never been afraid to confound with imagery that came from a mind so sharp but open, taking everyday images but putting them into situations that at first seem to make no sense at all but on further study become clear, poignant, deep and meaningful. 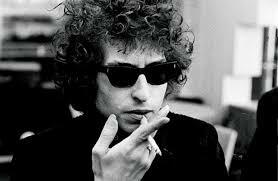 “I got forty red white and blue shoe strings / And a thousand telephones that don’t ring”.- from Highway 61 Revisited. 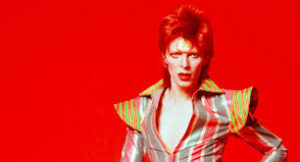 Another artist happy to play in the world of the absurd and surreal, and again, like Dylan, able to do so over a long career, was David Bowie whose lyrics were always challenging and stimulating. Bowie was an artist who wore his influences as badges of honour but whose influence on those that followed him cannot ever be underestimated. Bowie gave a voice to so many disaffected loners, to misfits and outcasts and gave permission to people to be who they wanted to be. And without him the world of music would have been so very much poorer. Becoming a teenager in the 1980’s for some of us our exploration in music went hand in hand with an awakening in a number of other interests, in particular politics, art and literature. And often a burgeoning interest in these subjects set one apart from the ‘normal’ football playing and pop chart following kids who thought reading was just a little bit weird. And indeed admitting reading Oscar Wilde, for instance, was tantamount to sticking a kick me sign on your own back. Hand in hand went an exploration into music that the outsider could identify with; and where the previous generation had Bowie, in 1984 we put gladioli in the back pockets of our black Levi’s and we listened to the bed-sit politics of The Smiths and the issue driven poetry of one Stephen Patrick Morrissey. Laterly the Mozz has become somewhat lazy in both his prose and poetry but for a brief couple of years his lyrics backed by the awesome guitar playing of Johnny Marr took poetic and polemic music into the charts and near coolness for those who identified with being a Goth. And anyway, who wants to be cheered up by music? 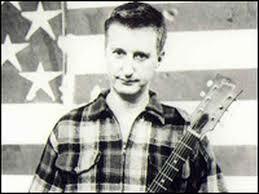 Billy Bragg has been become known as The Bard of Barking, The Poet Laureate of Punk due to his almost unrivalled talent for writing a keenly observed line, often laced with scathing humour and a ‘right on’ and important message. Like with The Smiths, finding out about Billy Bragg in the 1980’s was an awakening for many white middle class kids in home counties England who found out that there was a different world out there, one of inequality, and one in which it was necessary to fight for others less fortunate than yourself. But Billy wasn’t just all politics and anger, he has also turned his hand to, and created some of the most beautiful love songs imaginable, albeit ones written in his own inimitable voice. 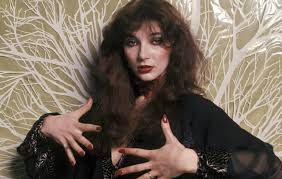 In 1978 Kate Bush released her debut album The Kick Inside which I have already written about in this blog link http://tarkablowpigmusic.com/2018/02/classic-album-no-1-the-kick-inside-kate-bush/ However, it is fair to say that with its references to literature in songs such as Wuthering Heights Kate is and was heavily influenced by writers, influences that she put into her own poetic lyrics. But what makes it so amazing is her tender age at the time she wrote these songs, written as they were between the ages of 14 and 16, leading to comparisons to influential authors such as the Bronte’s. The Man With The Child In His Eyes is a haunting, emotional and disturbing piece of lyrical genius. 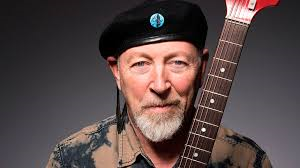 I make no secret of my admiration of the performer who I think is the greatest of all time, Richard Thompson. A fantastic guitarist, both electric and acoustic, RT is also a consummate song writer who created brilliant works at a very early age, writing Meet on the Ledge, a song that still holds its power 50 years on, at the age of 19. As the years have gone on, both as a member of Fairport Convention and then as a duo with his first wife Linda, and more so as a solo artist Richard has demonstrated a keen and intelligent poetry of observance, putting detail into his songs that bring the stories he tells to life bringing the listener into the song. ‘I’ve seen you on the corners and cafes it seems, red hair and black leather my favourite colour scheme’ – From Vincent Black Lightning 1952. As a lyricist Jarvis Cocker of Pulp is, for me, one of the voices of the 1990’s, one who took on the mantle of Morrissey. Pulp’s songs again were ones that told stories of common people, people who struggled and who aspired to what became the Cool Brittania of Oasis and Blur. An acerbic wit, Cocker held a mirror to society in a way that was both harsh and humorous, but also made comment on his own social inadequacies and foibles. As a documenter of the absurd and alternative American lifestyle, Bob Dylan only has one equal which is Tom Waits. Wait’s drunken tales of bar flies, flawed characters, criminals and the underbelly of American life are incomparable in their imagery. And with Wait’s delivery coming from a voice scarred by hard living his poetry puts him firmly carrying the fame of the likes of Jack Kerouac. ‘Well, Frank settled down in the valley, and he hung his wild years on a nail that he drove through his wife’s forehead.’ – From Frank’s Wild Years. And in this post when mentioning Dylan and Waits you have to also mention the songwriter who came to music from a literary background, having been a published author before having success with his music. Canadian Leonard Cohen has written songs that explored religion, politics, isolation, sexuality that have a gorgeous flow of the poetic of them. In many cases Cohen’s songs have become more famous when recorded by others, especially the wonderful Hallelujah, with artists such as Jeff Buckley and Kathryn Williams taking his poetry and raising the song to heavenly heights. ‘Now, I’ve heard there was a secret chord, that David played and it pleased the Lord, But you don’t really care for music, do you?’ – From Hallelujah. Over to you, any poets in music you think should join this list? I don’t find anything in this post I’d disagree with – pretty much spot-on.